At the June School Committee meeting, Halifax Elementary School Principal Claudia Motta announced that she would be leaving Halifax Elementary School at the end of June. John Tuffy, Silver Lake Superintendent, then stated that Assistant Principal Kayne Beaudry would take the position of Interim Principal for the 2015-2016 school year. At the end of the upcoming school year, if the School Committee was pleased with Mr. Beaudry’s performance; they would offer him an extended contract. 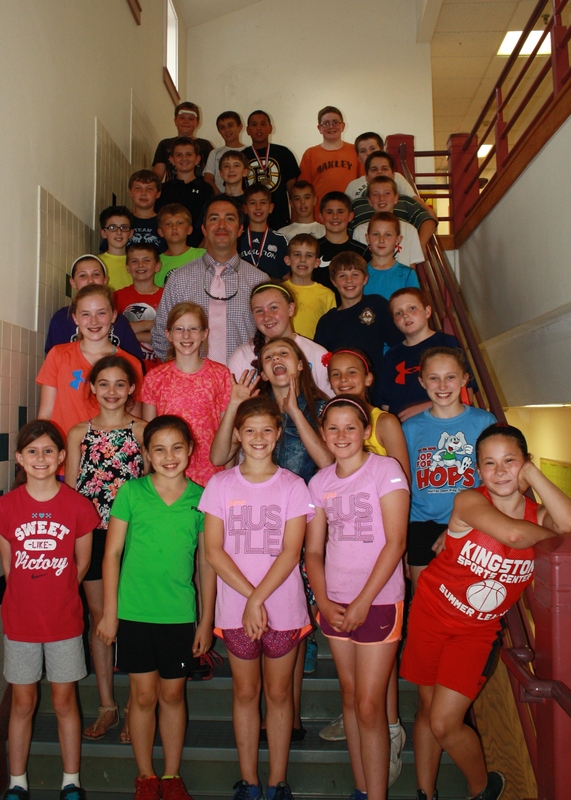 The fifth graders from Ms. Belcher and Mrs. Orcutt’s classes wanted to know more about Interim Principal Beaudry, so on June 23 they held a town meeting with him to find out more. The students had many questions about Principal Beaudry’s background. They learned that he has a Bachelor’s degree in Science from the University of Massachusetts, a Master’s degree in Elementary Education from Lesley University and a Certificate of Advance Graduate Studies in Educational Leadership from Bridgewater State University. Prior to coming to Halifax Elementary four years ago, Mr. Beaudry taught sixth grade in the Everett school system, and third and fourth grade for 10 years in the Cohasset public schools. Growing up, Mr. Beaudry wanted to be an Architect because he liked to draw and build things. His favorite subject is writing which he struggled with as a younger student, but he improved upon as a classroom teacher. He feels writing is a great way to express yourself and your personality. Mr. Beaudry is excited for the opportunity to be Principal at Halifax Elementary. He hopes to be able to continue to build relationships with the staff, students and community. He has seen a lot of great things at the school and hopes to continue to foster a positive environment. He is eager to get started, but anxious because he has never been a Principal. Mr. Beaudry told the fifth grade that he wished he had been a classroom teacher at HES, and that he hears that being a fifth grade teacher is the “best.” When asked if he would change anything about the school he said he would love to add air-conditioning, which got a lot of support from the students, but he likes the history of older buildings and likes the challenge of maintaining the architecture while keeping up with technology. The fifth graders were very interested in Mr. Beaudry’s personal life. They learned that he is married and has three children: Gus, 9, Stella, 7, and Tess, 5. They like to watch movies together including “The Book of Life” and “McFarland USA.” His family has a dog named Bean, a cat named Flea, a guinea pig named Pig and 10 chickens. Mr. Beaudry has been an avid hockey player since childhood and continues to play in a men’s league. His favorite dinner is Annie’s White Cheddar Mac-n-Cheese and he does not drink soda, but likes lemonade and iced tea. He doesn’t eat donuts and likes bacon, but not as much as he likes cheese. Mr. Beaudry is also a big fan of the Taco Boats they make in the school cafeteria and likes the coffee/pistachio twist they serve at JC Dairy in Hanover. Mr. Beaudry is sad to see the school year end as there are some things he’d like to complete before the year is out. When one student said the end of the year was bittersweet he agreed. One place you probably won’t find Mr. Beaudry this summer is on a rollercoaster, unless his daughter Stella talks him into it!